It all began this past November when the JP Morgan Chase Foundation developed an innovative online charity campaign, handing the keys over to millions of Facebook users to decide which non-profit organizations should share in $5 million worth of grants. The campaign, Chase Community Giving, wrapped up last week, engaging more than two million supporters in the process. Drum Corps International's Carolina Crown, the Cavaliers, Colts and Phantom Regiment were four of 100 organizations that made it to the final round of voting and were each awarded $25,000. Through a united effort between DCI and its member corps, drum corps fans were encouraged to vote for all four groups in order to push them closer to top prizes that included a $1 million grant. After the ballots were tallied, the JP Morgan Chase Foundation announced the final outcome of the vote on Jan. 23, with all four drum corps in the top half of the results. 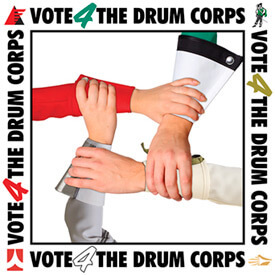 At the close of the campaign, the four corps wrote in an open letter to supporters: "All four drum corps stayed in the hunt during round two, thanks to a concerted effort by the fans to get out the vote not just for their favorite corps, but for the other three in the race as well. That's a show of solidarity that no other charities brought to the table. Drum corps fans went out and made it clear that our activity isn't about competing against the other corps; it's about competing "with" the other corps." Nov. 15, 2009: Facebook users were asked to choose their favorite organizations among more than 500,000 charities that were part of the first round of the Chase Community Giving campaign. Dec. 16, 2009: Chase announced the 100 finalist organizations from round one that would each receive $25,000 grants. Among the 100 organizations still in the running for the top $1 million prize were four DCI corps; Carolina Crown, the Cavaliers, Colts and Phantom Regiment. Jan. 11, 2010: All finalist organizations revealed their "Big Ideas" detailing how they would put the $1 million grant to use. Video summaries of those proposals were posted on the Chase Community Giving Facebook page. Jan. 12, 2010: Drum Corps International and its member corps teamed up encouraging drum corps fans to Vote 4 the Drum Corps! Jan. 15, 2010: The second and final round of voting kicked off on Facebook. Jan. 19, 2010: A national Vote 4 the Drum Corps! press release hit the wire acknowledging the four DCI corps in the running for $1 million. Jan. 22, 2010: The second round of voting ended on Facebook. Jan. 23, 2010: Chase announced the final results of the campaign. The first place charity, Invisible Children, Inc. of San Diego, Calf., finished with a total of 123,990 votes. Check out the complete results of the Chase Community Giving campaign on Facebook.